The white-leaved rockrose (Cistus albidus) was present in the XV Phytohormones Symposium 2018. 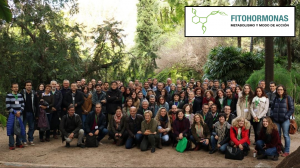 This Symposium was held last December 13-14, in Valencia (Spain). Marina Perez-Llorca, PhD Student at the ANTIOX Team, presented her last work on this species with a short talk entitled: “Inter-individual and sun orientation driven variability reveals antagonistic salicylate and jasmonate accumulation in white-leaved rockrose“.